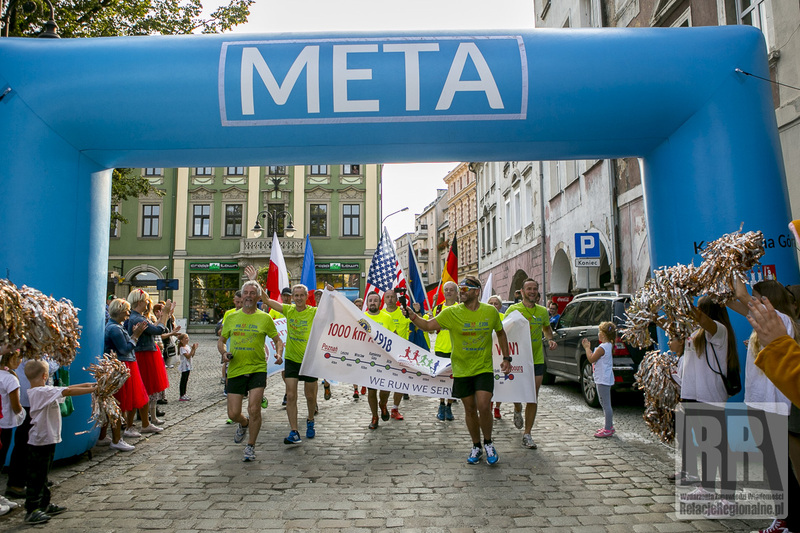 Wroclavian Freedom square is perfect for charity event. Wroclav people often use name „pl. 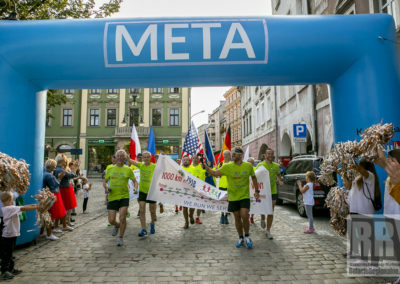 Wolności“ (Freedom square in Polish), we use „Freedom Charity Run“ for our event, but it is not important what language we use when the meaning is the same. Irek Maj together with Jack Garstka did give signal to start. 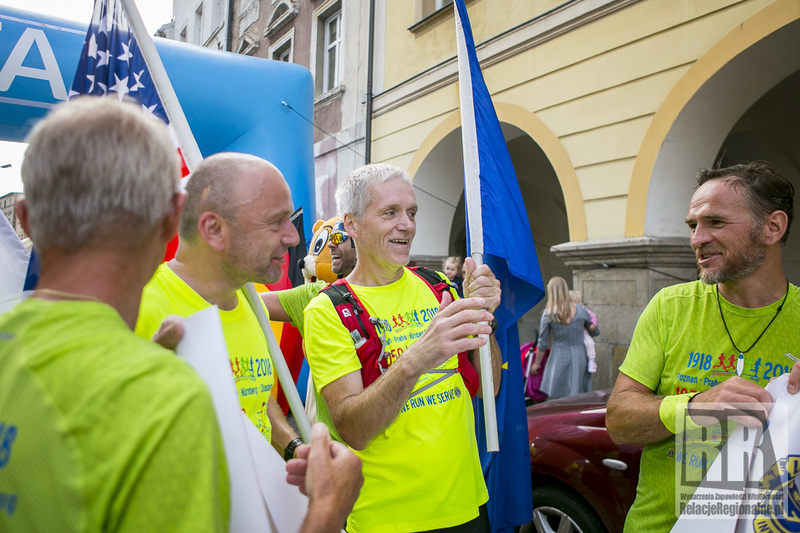 All of us participated in first metres, next 20 km were just form Daniel and Hubert. Today we have 102 km to run. 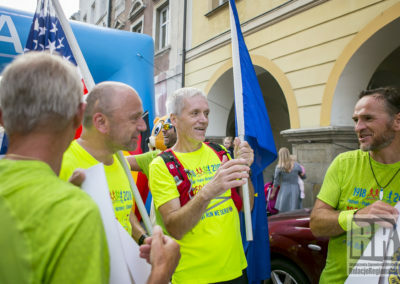 Besides me, all of us have half-marathon to run, me quarter of the marathon distance. It is good that we received bunch of plums from Betty and Irek – we will surely take advantage on the vitamins. Temprature is 20 C now in the moment, but it will be 27 in the afternoon. So hot! 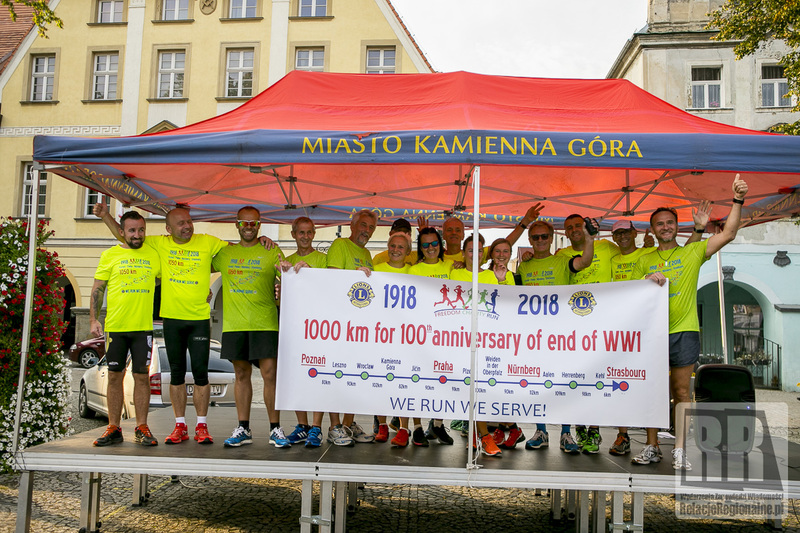 We run from Wroclav to Sobótka. Few times we cross the highway or run nearby. 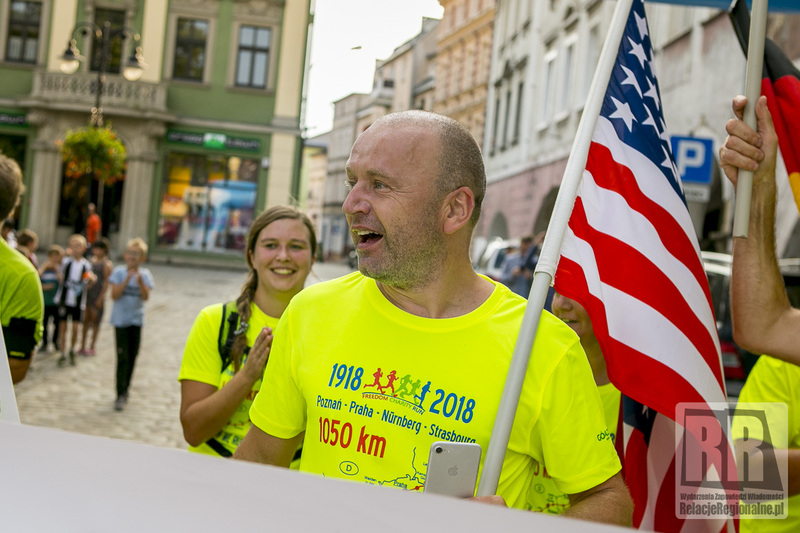 Monday morning, our blood flows faster through our veins because of the running similarly to stream of cars riding faster through the highway due to polish economy. Warehouses, office buildings, roads in construction, Poland is a place of big investments. I am very proud looking at progress we did in just 30 year. I passed crossing of Korean and LG street – I have so much laugh from it, where am I??? In a moment I will understand genesis of those names – on the left enormous warehouse of the Korean concern, one of the biggest foreign investments in last years in Poland. Some of the people in our country are dissapointed that it is not factory of TV „Neptun“ from early 70s. Rest of us are glad that we have great macro-economic circumstance which brings attention from foreing capital. That type of investment creates thousands of job vacancies, nearby many businesses are established, hence our economy is getting stronger. Let‘s get richer with the rest of the Europe and World like we doing it since 1989 with common respect. 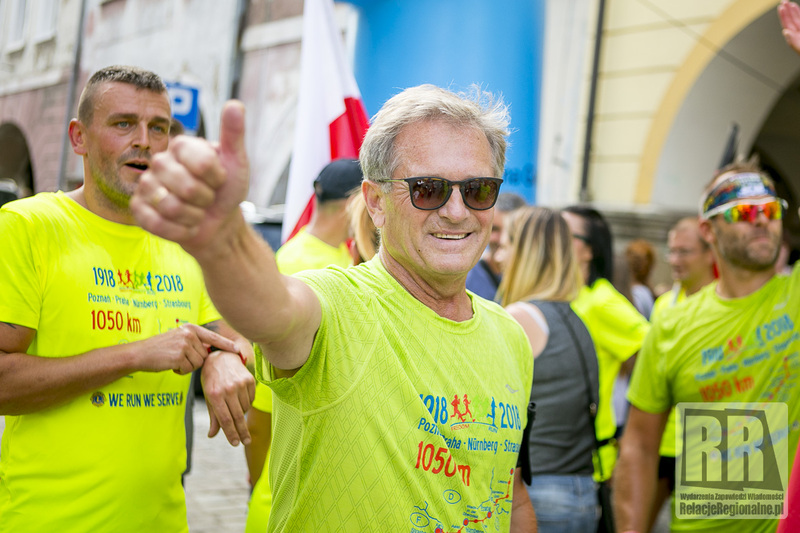 This year, Hubert gained additional sponsors : Cement factory from Górażdże, Filplas – windows producer for europeand and world market, Krapkowice district. Thank you all, it will help us cover current expenses and the rest we donate to children refugees from Syria and for Matilda. As far as sponsors are concerned, I need to mention Texet Poland donation which helped Lions Clubs cover cost of 500 pcs of printed t-shirts. It will be distributed for 10 Euros each. Amount is the same as we usually ask for. All of the gathered funds will be thoroughly transfered to the receiving parties. This year t-shirt are outstanding, hence so many people are interested in buying one. 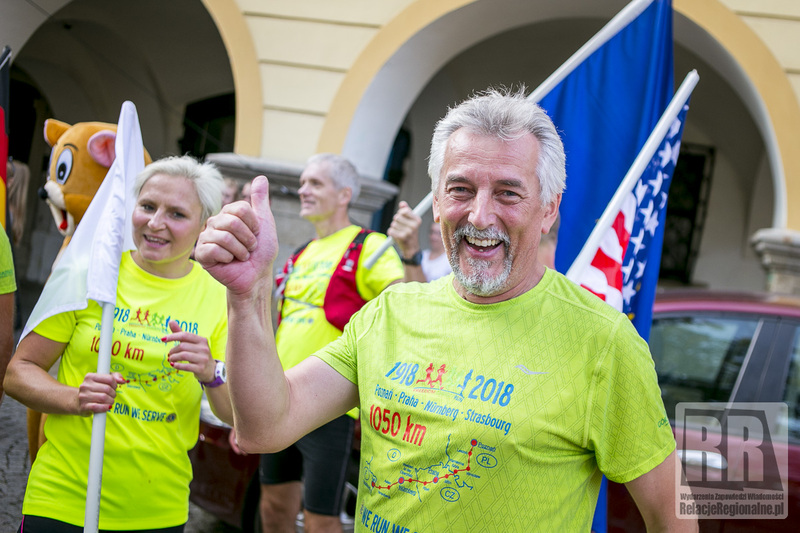 KGB was waiting for us 8 km ahead of Kamienna Góra in that t-shirts. 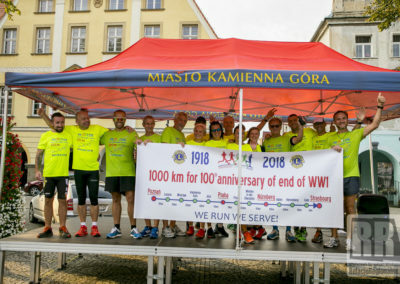 KGB stands for Kamienogórskiej Grupy Biegowej (Kamienna Góra Runners Group). Ten young people, Arek Jaracz and Arek Dybiec from the city hall which I have mentioned before, and Ada Pakuła, great organizer, fluent Czech speaker, amongs them. KGB promised to run with us to south border tomorrow and they have guided us to local market. That kind of reception we did not expect. 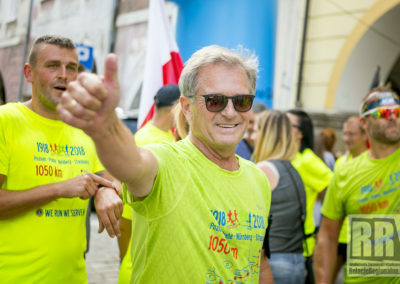 Hundreds of inhabitants with mayor Cristopher Świątek leading them were waiting ahead of aired baloon at the finishing line. 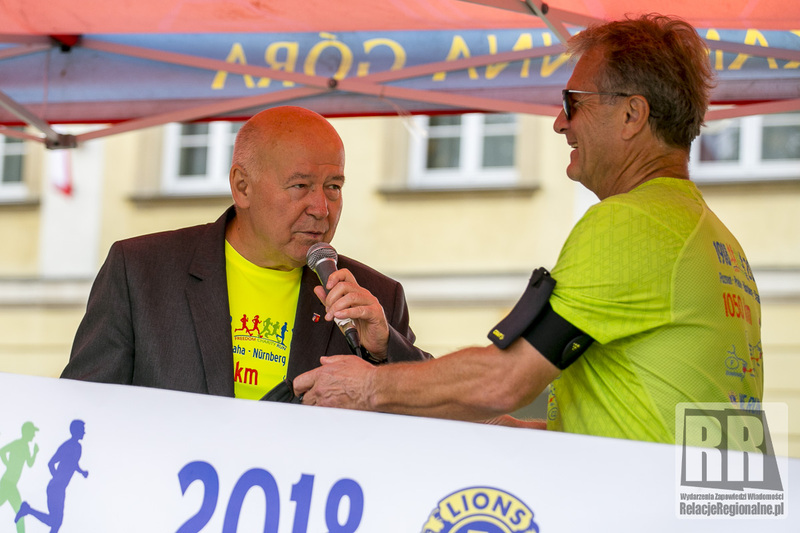 Soon after we crossed the finishing line we were asked to join them on stage in order to tell about our cause. Next, dancing group taught us Salsa, which all of the people gathered there danced in a few moments later. Perfect muscle stretching after one of the longest distances. In the evening, we spent time in restaurant „U Leszka“. Delicious hock helped us fill lacking collagen in joints. Rest of meals are probably delicious too. Owner, Leszek organized a party when Poland was accepted to join EU in Strasbourg on 19th November 2002. He will be in Strasbourg in two days, however he needs to get back by the end of the week, hence we will not meet in Strasbourg this time. 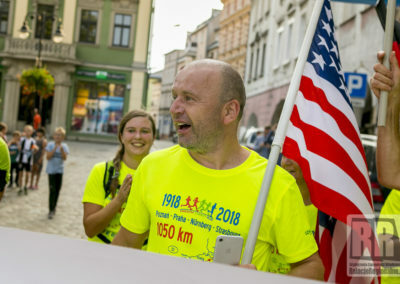 Stage was longer than two before it, not only because it was longer distance generally, but also because Johnny had to get back to Cracow, business matters. Every one of us had more kilometres. Moreover, it was third runnind day, reportedly the crisis one. After we left Wroclav we run through local roads, often without roadside. One of the roads was through corn fields and sunflowers. In reminded us countryside from Kentucky or Indiana, of course it was not the same view. 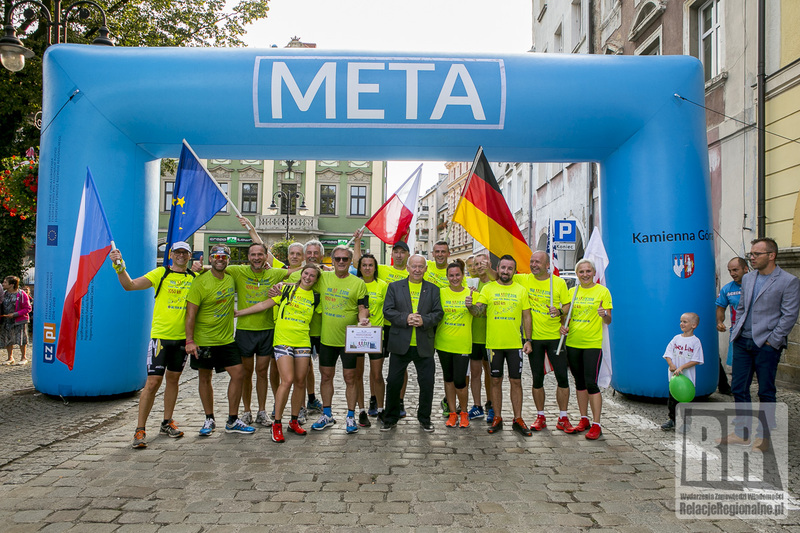 After 22 km, it mentioned scenerio, we left last km for me and Hubert to run across Kamienna Góra and run through local market. It was marvelous like Mariusz wrote above.